Take on your anxiety by the horns. Feel like a bullfighter rather than someone running from a stampede? Are you someone who is struggling with anxiety and panic attacks? Do you feel depressed because of it? Are you suffering from a long bout of anxiety and cannot see the light at the end of the tunnel? Do you feel restricted and fearful due to your anxiety? As a person who suffered from anxiety on and off, I completely understand your plight. That is why I have composed this guide, instructing you through the type of anxiety you might have and the strategy that you can use to tackle it head-on. 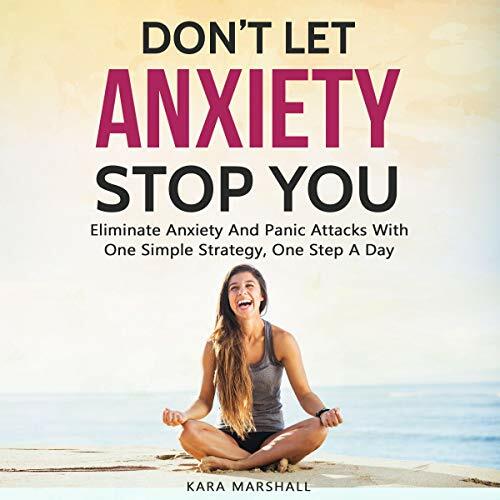 This audiobook is here to provide you with information about anxiety and panic attacks as well as strategies and techniques to deal with them. I know that getting back from that dark place could be a challenge. But if you take action, then you will be able to fight anxiety head-on. Every day that you spend without a guided and step-by-step method to battle anxiety, could be another day that you surrender yourself to your demons. Stop suffering, take action now and buy this audiobook! This is a great book for anyone. This is a great book for anyone who wants to understand more about anxiety and learn effective techniques for reducing anxiety. I recommend her book to many of my therapy clients suffering from anxiety. This book is perfect. It's written perfectly and you can tell that the book was intended as a tool to help people with anxiety. I have a few others by different authors and they're junk. I definitely recommend this. A wonderful book! It starts with an honest description of the author own experience with anxiety and moves into a targeted, constructive plan to battle your own anxiety. A quick and easy read that will encourage a systematic way to tackle your fears. Everyone can use this! Practical ways to change your life. This is a great book that was recommended to me. Clearly, the author is a passionate voice for those who suffer from anxiety. She provides wonderful stories, inspirational quotes, and practical ways to change your life. I like best about this book is the author’s truth and honesty on how to work through life’s challenges and create your own path to believe in the best. Thanks for sharing your story! It's an easy listen with practical advice. The author has done a fine job of offering solid strategies and authentic compassion for individuals coping with anxiety. This is a listenable book suitable for both professionals and patients. It's an easy listen with practical advice. I found the book to be extremely helpful in dealing with anxiety by providing practical tips and techniques that could be easily followed and implemented. For anyone who wants to conquer anxiety issues and fears holding them back from enjoying life, this book is a must listen! This book is absolutely fantastic!! This book is absolutely fantastic!! Its definitively a page-turner while learning something new and interesting with each chapter. I would recommend this book to anyone who suffers from anxiety or to someone who wants to educate themselves on the topic. This a great resource to help you stop feeling so anxious. Written with care and support for those of us who run anxious, it gives practical suggestions to help you feel more in control. For years I struggled with panic attacks and I so wish this book had been available then! Listen to it - follow the exercises - and notice how much better you feel!